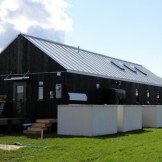 The team from Middlebury College built a passive and active solar home called Self-Reliance that performed well and was awarded 1st place in the Market Appeal competition in the 2011 Solar Decathlon. Inspired by Ralph Waldo Emerson, not only would this have been an ideal home for the philosopher, it is perfect for anyone looking to realize the freedoms within independent living. 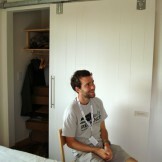 Middlebury built a home called Self-Reliance for the Solar Decathlon. 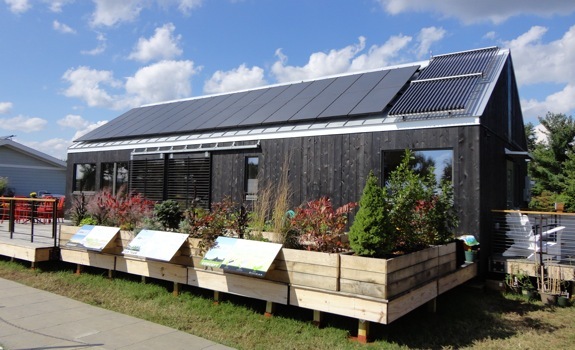 One of the only liberal arts undergraduate schools represented in this year’s Solar Decathlon, the team had a strong finish with the nicely designed, comfortable, 990 square foot home. 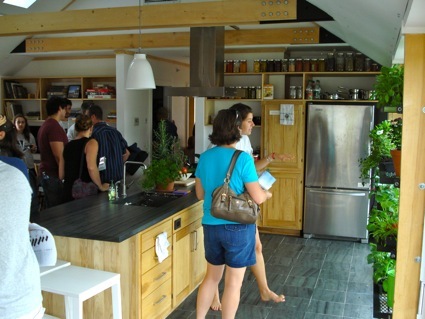 The home utilizes its space wisely, allowing the inhabitants of the home to be comfortable, while having the possibilities of generating their own electricity and growing their own food. The roof has a 7.2 kW photovoltaic (PV) array made up of 30 solar panels to produce solar based electricity, as much as 7,930 kWh on an annual basis. 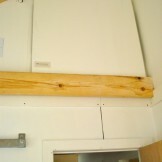 There are also evacuated solar thermal tubes to create hot water. 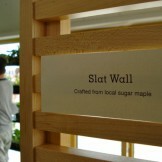 A slated wooden shade was designed as a passive means of solar control. The utilization of a sliding panel of wooden shades outside of the southern facing window is a smart passive solar method of moderating the amount of sunlight and heat that is allowed to enter the house. The wooden shades are mounted on a rail, and can be moved and situated to provide shade for both of the windows, or can be combined or moved to the side of the windows to help moderate the amount of light and heat that the sun can shine into the home throughout the seasons. Because the wooden outer shades are slats, in the summer, when the sun is rotating high in the sky, it blocks the sun from entering the home, yet allows light into the room. 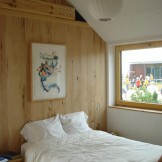 The shades can be moved to the right hand side to allow the full sun into the home when more warmth and heat is desired, typically in the winter. The view from the south toward the kitchen and growing areas. This home receives kudos for the thoughtful integration of local and natural materials throughout the home. Local wood and stone slate were utilized throughout the building of this house for the beams, cabinets, counter tops and floor. 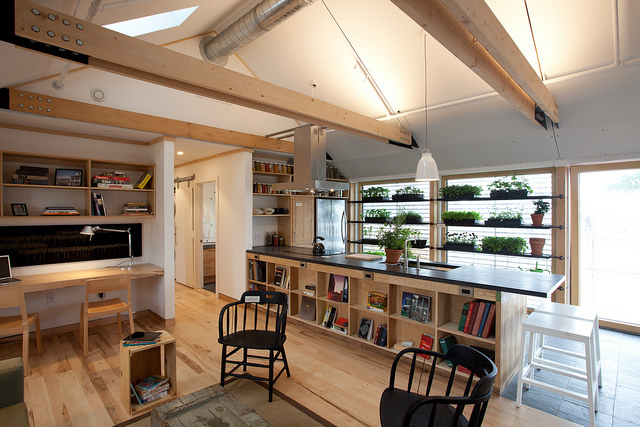 In the kitchen, an island breaks up the public space between the kitchen and living room areas. The kitchen is located on the south side of the home and is located adjacent to the southern facing window. 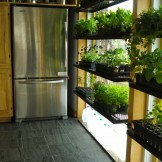 There is a wall of plants standing next to the window where herbs can be plucked to provide a fresh, delicious addition to meals. The plant wall can be used to grow seedlings to be transplanted outside in the springtime or for year-round fresh plants and herbs. The local slate used for the kitchen flooring is a material that has thermal mass and can absorb and release the sun’s heat energy in the winter. 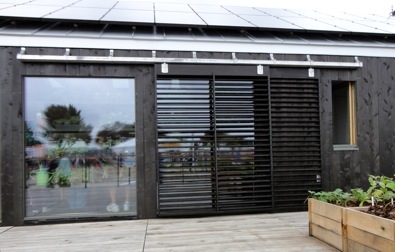 The higher rotating summer sun will be blocked by the wooden slats located outside of the window, yet the winter sun’s heat energy will shine into and help to heat the home. 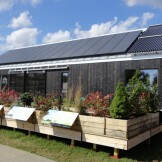 This type of passive solar design helps the house to stay cool in the summer and warm in the winter. 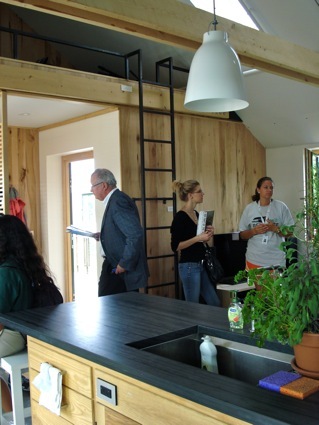 The slate material in the kitchen used for both the floor and counter-top work in conjunction with the outside wooden shade to moderate the temperature and amount of solar heat absorbed in the kitchen. Middlebury’s peak roof also provides space that can be utilized for storage. The peaked roof on the home not only provides a practical place to mount the solar photovoltaics, allowing it to shed snow and rain, but it also provides a lofty, grandiose feel to the home. 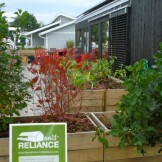 There are many advantages to having a peaked or joined roof. 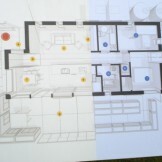 The home also has a HVAC system located within the peak of the home. It has an air to air heat exchanger that can pull humidity from the house to supply the plant wall with condensed moisture. Air can also be purified and filtered, while hot air can be flushed from the home. The configuration of the roof also helps the home to utilize ‘stack effect ventilation’, a passive means of cooling a home. 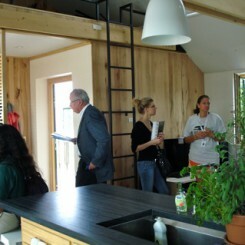 Cool air is brought in through the lower windows and leaves the house through the vented skylights. This type of convective air channeling is also utilized with clerestory windows in an ‘envelope house’. The peaked roof also provides additional space within the home that can also be utilized for storage space or additional guest space. 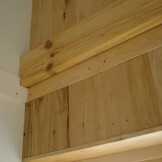 There is also a loft space that can be seen located above the entryway. 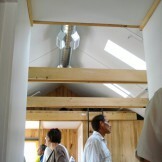 A section of the mechanical room is also located above the main living area and allows the house to have more usable living space. 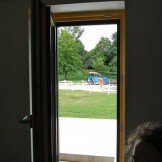 The mechanical room is accessible from one of the bedrooms and can be seen in the gallery below. 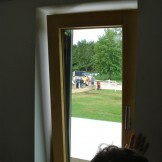 The windows are triple paned with a cork insulation backing. The home has triple pane, cork insulated windows. 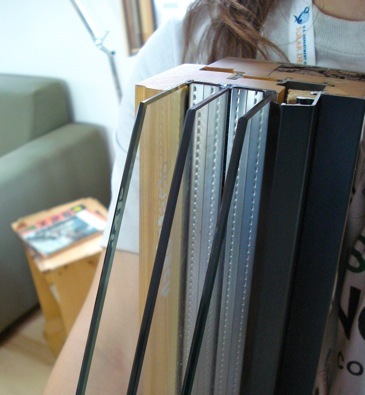 These triple pane windows have the ability to open and vent at the top, or can swing open to the side. 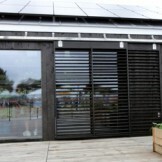 Made by a German manufacturer, it is another example of the best and newest materials that students work and become familiar with by participating in the Solar Decathlon. A full bathroom is a nice feature in Self-Reliance. Photo credit: SD, DOE. 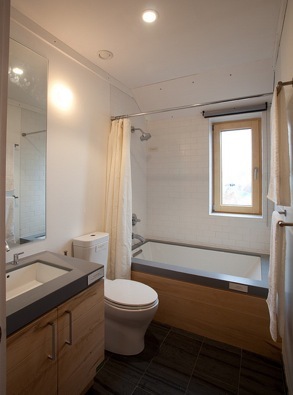 This home has a full bathroom, with a window to let in light. 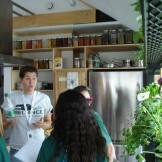 Natural and local materials were also utilized for the counter tops for the sink and bathtub. Two bedrooms are located within the private sphere of the eastern side of the home. 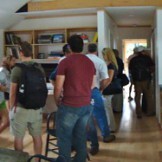 The home from Middlebury is estimated to cost $282,600 to build. 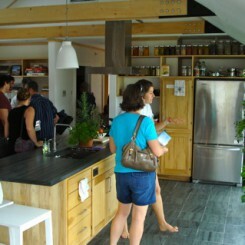 At this moderate cost, this energy efficient home is within the means of many people to be self-reliant. See more pictures and see a video of Self Reliance below. Click on a picture below to enter a slideshow of the photo gallery. Middlebury College finished in 4th place in the 2011 Solar Decathlon. They received 1st place in the Market Appeal, Communications and Home Entertainment competitions. 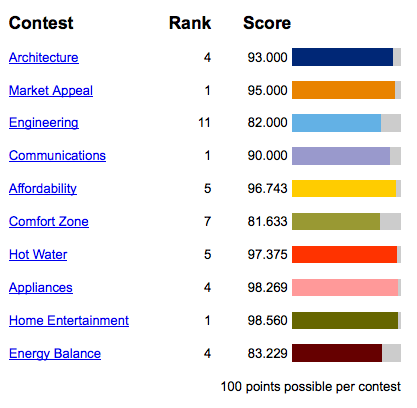 The team also scored well in the Energy Balance Category. A screenshot of the final scores for Appalachian State. Excellent job to the team from Middlebury College!